where R is a correlation sphere radius and H denotes the Heaviside's function. |xi - xj| is a distance between two points from the attractor. In the optfinderML user should set ranges of the sphere radius and parameters for the attractor reconstruction via the Time Delay Technique i.e. the assumed value of the time delay and a final value of the embed dimension up to which program will compute the correlation dimensions. at small R. The dG with the growing embed dimension reaches its limit value. Further increasing of embed dimensions D does not change the correlation dimension (see figure below). dG = 1.019 for D = 3. 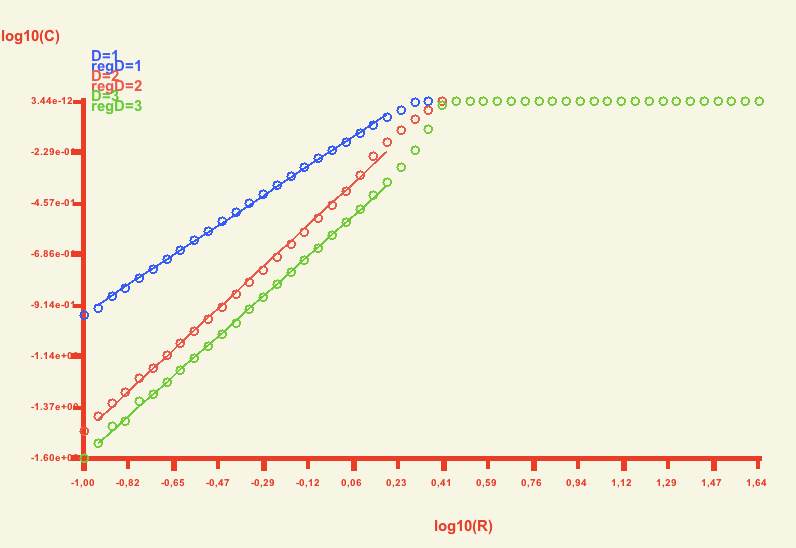 In the optfinderML, uncertainty of regression can be shown in the graph. In all presented cases, computed error lines are too close to regression lines and they are not seen as different from the central regression lines. Thus for better figure's clarity error lines are not plotted in the picture above.